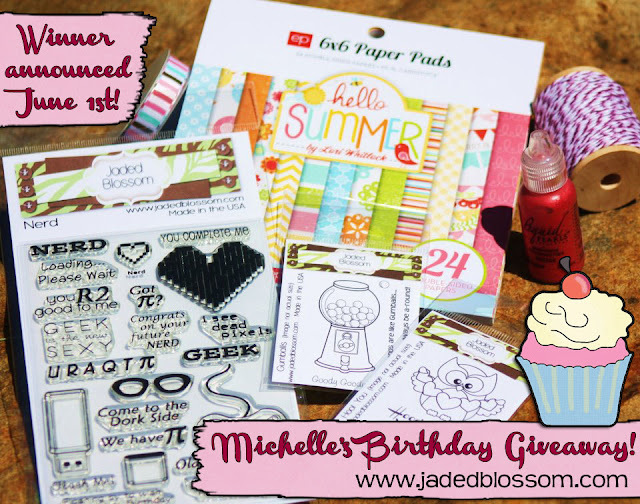 Jaded Blossom: Michelle's SWEET Birthday GIVEAWAY!!! Check out all that yummyness!! THREE Jaded Blossom stamp sets, twine, ribbon, one of the newest Echo Park paper stacks and some liquid pearls!! All you have to do to be entered to win this is be a follower of our blog here and wish Michelle a happy birthday in your comment. For an EXTRA entry.. head over to Michelle's Scrappin with my Bug facebook page and wish her a happy birthday!! Then make a second comment here saying you did so. and once again I just want to say Happy Birthday Michelle! I hope you have a fabulous day filled with paper, ribbon and twine!! What a wonderful giveaway for Michelle's birthday. Happy Birthday Michelle!!! Went over to Michelle's FB page and wished her a Happy Birthday!! Happy birthday Michelle! I pray you have an extremely blessed day. Enjoy your family and this wonderful hop. Thank you for being the kind person you are and sharing your wonderful talent with us all! Birthday hugs all the way from Ohio! Happy Birthday Michelle! Have a great day! Happy Birthday Michelle! I hope you have an Awesome Day! Your Gals did an Awesome Job on their creations for your Surprise Birthday Hop. HAPPY BIRTHDAY MICHELLE!!!!! You jaded blossom girls did a fabulous job on the Surprise Birthday Hop. Was more than happy to wish Michelle a Happy Birthday on her facebook page. Happy Birthday to you, Happy Birthday to you, Happy Birthday dear Michelle, Happy Birthday to you. Thank heavens there is no sound because a singer I am not. Have a great day. Happy Birthday Michelle!!!! Hope you have a sweet birthday!!! just wished Michelle Happy Birthday!!! All of you ladies did an amazing job on all your projects!!! Happy Birthday Michelle. How does it feel to be 16 again? Hace a great dt. happy Birthday Michelle. Your friends really made wonderful projects for your birthday celebration. Happy, Happy Birthday Michelle!!! I hope your having an amazing day... Thanks for the chance to win too.. HAPPY BIRTHDAY MICHELLE!!! Hope you are having a good one!! Thanks so much for sponsoring this blog hop! I am a new follower! I went to Michelle's facebook page and left her a message!! Thanks for the second chance to win! Happy birthday Michelle!!! This was a fun blog hop. Lots of beautiful projects to be inspired by. Happy birthday Michelle! This was pretty sneaky on behalf of your crew!!! :) Hope you have a beautiful day! Great hop! Happy Birthday Michelle! Wished Michelle Happy Bday on FB! Happy birthday, Michelle!!!! May your day be filled with even more suprises than your friends have so lovingly showered you with already! Happy Birthday Michelle! What a fun hop in your honor! Happy Birthday Michelle!!! What an awesome hop! Fantastic projects by all!!! Happy Birthday Michelle!!!!!!!!! Hope it's the best b-day ever! thanks for the chance to win im a follower. I wished Michelle a Happy Birthday on her FB wall! Thanks again for the chance to win:) Great job everyone! Happy Birthday to Michelle! Thank you for the chance to win all these goodies. All the projects were great!! Loved them all. I wished Michelle a Happy Birthday on her Scrapping with my Bug FB page. Michelle may you have an awesome birthday!! Happy Birthday Michelle! How your day was awesome! Hope you have a great birthday Michelle. Happy Birthday!!!! Hope your birthday if filled with love, friendship, and lots of memories! I wished her Happy Birthday on facebook as well. I wished Michelle a Happy Birthday on FB too! happy happy birthday michelle and many more!!!! Happy Birthday Michelle! I hope you have a fabulous day! Happy Birthday to you and Many More, Michelle!!!!!! !Let the Celebration begin!!! I wished A Happy Birthday to Michelle on FB!!!! I'm a follower here! Happy birthday Michelle! I went over and wished Michelle a Happy Birthday on her FB page! Great giveaway! So excited to be a new follower and Happy Birthday Michelle I hope it is a very very happy one!!! I also stopped by on fb! Lisa Bankes-Lahiff thank you again! Have a Happy Birthday Michelle! Happy Birthday, Michelle!! Hope it's a great one! I enjoyed the hop. You ladies sure are talented. On my way to Mechelles blog to wish her a HB. I wished her a Happy Birthday on fb!!! Michelle Happy Happy Birthday have the Best Day ever. may all your Wishes come True. Iam a follower if your Blog thanks for the chance to win this Awesome Giveaway. I just became a follower and love the giveaway! I also spread the Birthday luv on FB and her blog!! Happy birthday to you Happy birthday dear Michelle Happy birthday to you. Happy, Happy Birthday Michelle!! What a super fun way to celebrate your birthday with such a fun giveaway and amazing hop! So many beautiful projects all in honor of YOU!! :):):) Hope you enjoy your day! Happy Birthday Michelle! Awesome birthday hop! Michelle, I hope your birthday is everything you wished for and more! I just went over to her FB page...and started reading and looking around and forgot all about the hop. She's super talented. I've liked her page. Have a great day!! Everyone did such an awesome job. I am amazed with all of the wonderful cards. Thank you for sharing and again, Happy Birthday Michelle! I just left a facebook Happy Birthday to Michelle. HAPPY BIRTHDAY MICHELLE! Hope you have a very special day!!! Happy Birthday!!! Enjoy and take in all the bday wishes. Happy Happy Birthday Michelle! Hope your special day was extra crafty! I hope you enjoyed your birthday Michelle! You have some awesome and talented friends. Happy Happy Birthday Michelle! Thank you for a Hoppy friday! Many more years of success and creativity and happy birthdays! Happy Birthday Michelle! Hope your day was wonderful. What a great hop...everyone did such a great job. Sent Michelle a "Happy Birthday" wish on her Scrappin with my bug facebook page! Happy Birthday Michelle!!! Hope you enjoyed your special day!!! Xoxo!!! Just tried to post on Michelle 's page but it disappeared... 0_o... Lol so I sent her a msg!! Happy Birthday Michelle!! Stopping by her blog to say it again. ;) <3 my JB enablers! ╚╝╚╩╝╚╩╝╚╝═╚╝ ♥(¸.•´ (¸.•´ (¸.•¨¯`★ ♥♥♥ ENJOY YOUR DAY! Michelle Hope your Birthday is as inspiring as your are! Wished Michelle a happy birthday on her fb as well! Can't have too many happy birthdays. I also wished Michelle a Happy, Happy Birthday on her FB page. Wishing Michelle a wonderful Birthday full of joy, sunshine and scrapping. Went to FB to wish Michelle a Happy, Happy B-Day! Hope you had a PHENOMENAL birthday and wishing many more for you! Happy Birthday Michelle!!! I hope you have a fabulous day! Wished Michelle a Happy Birthday on her Facebook wall! Happy Belated Birthday Wishes Michelle! I am a follower. What a awesome giveaway. Thanks for the chance. I wished Michelle a happy birthday on her facebook. Happy Birthday Michelle! and thanks for a chance at these goodies! Happy Birthday Michelle I sure hope you had fun crafting.